Today was a very special day as we entertained visitors from Poland and Spain. The children were very excited and Year 5 & 6 carried out some research about the countries in preparation for their welcome. The children that won the competition for the best research were Hallie-Marie, Ffion and Hannah for Spain, and Cameron, Anya and Dylan for Poland. We delivered an assembly for our visitors where we first watched a video of all the wonderful things that the children of Pencaerau have done over the last year and we also shared our research with them. The year 2s then performed a traditional Welsh folk dance, which they learnt for St David’s Day. The visitors were happy to see such a wonderful dance. The visitors were then entertained by our school choir and our staff choir who belted out a several lovely songs! We then gave out some awards and trophies to the children which are now going to be termly awards. The winners of the awards were Kaiden, Dion, Reece and Lily-May for Eco-councillor of the Term, Welsh speaker of the Term, School Councillor of the term and Writer of the Term respectively. After assembly the visitors helped us to plant a ‘Friendship Tree’, which was planted at the front of the school by the main office. The tree represents our friendship with the visitors. 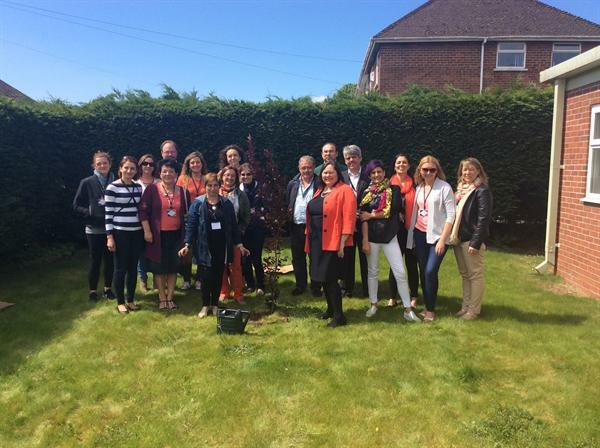 Some of our staff have visited their schools in Spain and Poland over the last 12 months and a friendship is growing, just like the tree! The visitors then went to the parents’ room where they sampled a variety of our traditional foods. They then visited our classes and were really impressed with what we do and how engaged the children were. They were very shocked at how different our school is to theirs, but they left with big smiles on their faces!